Ideal for the manufacturer who is looking for a heavy duty machine with the durability for constant daily use. A very substantial machine designed for every day use. 400mm Ø saw blade giving 110mm max. 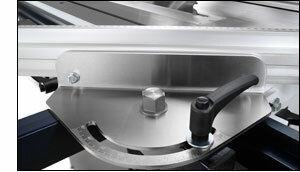 depth of cut plus a mitre and bevel capacity of 45˚. The carriage has an automatic return mechanism allowing the motor to run continuously. Ideal for high production situations. 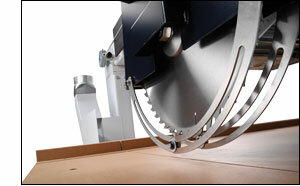 Designed specifically as a raw saw, unlike most saws on the market today. As an option the machines can be supplied with motorised tilting and rise and fall. The rip fence has a superbly engineered fine adjustment system which will withstand the rigours of everyday use. An overhead bridge guard provides top extraction with an additional connection to the rear of the machine. With blade diameters up to 600mm and a range of motor powers, these machines will deal with both soft and hardwoods with ease.